So Easter is here again and everybody is mourning the death of Tammuz and rejoicing in the new life to hatch from digested easter bunny eggs. But let’s be serious and respect the meaning of the season. Let’s talk about messiahs, especially suffering and dying ones. If these verses do indeed refer to the Messiah, they clearly predict his suffering and death to atone for the sins of humans, but the Jews allegedly always interpreted these verses as referring to the suffering of Israel herself and not the Messiah, who would only triumph. To sum up this generally held view: The theology of the suffering of the Messiah was an after-the-fact apologetic response to explain the suffering and ignominy Jesus suffered, since he was deemed by “Christians” to be the Messiah. Christianity, on this view, was initiated by the fact of the crucifixion, which is seen as setting into motion the new religion. Moreover, many who hold this view hold also that Isaiah 53 was distorted by the Christians from its allegedly original meaning, in which it referred to the suffering of the People of Israel, to explain and account for the shocking fact that the Messiah had been crucified. 4. See Martin Hengel, “The Effective History of Isaiah 53 in the Pre-Christian Period,” in The Suffering Servant: Isaiah 53 in Jewish and Christian Sources, ed. Bernd Janowski and Peter Stuhlmacher, trans. Daniel P. Bailey (Grand Rapids, MI: William B. Eerdmans, 2004), 137-45, for good arguments to this effect. 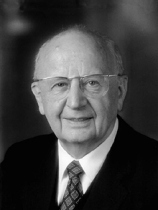 Hengel concludes, “The expectation of an eschatological suffering savior figure connected with Isaiah 53 cannot therefore be proven to exist with absolute certainty and in a clearly outlined form in pre-Christian Judaism. Nevertheless, a lot of indices that must be taken seriously in texts of very different provenance suggest that these types of expectations could also have existed at the margins, next to many others. This would then explain how a suffering or dying Messiah surfaces in various forms with the Tannaim of the second century c.e., and why Isaiah 53 is clearly interpreted messianically in the Targum and rabbinic texts” (140). While there are some points in Hengel’s statement that require revision, the Targum is more a counterexample than a supporting text, and for the most part he is spot on. So the argument rests on its explanatory power. I won’t repeat here the rabbinic texts Boyarin has in mind since they can be found in my earlier post, Suffering Messiah is a Very Jewish Idea. In that earlier post I also look at the evidence for the developing idea of a suffering messiah, one who identifies with martyrs, in Second Temple era books attributed to Daniel and Enoch. But don’t think you’re wasting your time by reading a repeat post here. There is much more to add. When I turned, he touched me, and I saw a man despised (Isa 53:3), severely wounded (Deut 23:2), and in pain (see Isa 53:3). Now that despised man said to me, “Zerubbabel, what is your business here? Who brought you here?” . . . . He showed me a marble stone in the shape of a virgin, and its appearance and form were most lovely and beautiful to behold. “This stone is the wife of Belial,” he answered. “Satan will come and lie with it, and a son named Armilos will come forth from it: ‘he will destroy the people,’ . . . He will rule over all, and his dominion will reach from one end of the earth to the other. . . . No one will be able to stand before him. Anyone who does not believe in him, he will slay by the sword, and he will slay many of them. He will attack the people of the holy ones of the Most High (see Dan 7:27), and there will be ten kings with him, with might and great strength. He will make war on the holy ones and destroy them. He will kill the messiah son of Joseph, that is, Nehemiah b. Hushiel, and sixteen righteous men will be killed with him. They will exile Israel to the wilderness . . . .
“This war will take place in the month of Av, and there will be trouble in Israel such as there never was before. They will flee to citadels, mountains, and caves; no one will be able to hide from him. All the nations of the world will go astray after him, except for Israel, who will not believe in him. For forty-one days all Israel will mourn Nehemiah b. Hushiel. His corpse will be thrown down before the gates of Jerusalem and broken, but no wild beast will touch it, nor bird nor animal. Then the children of Israel will cry out to the Lord from great oppression and deep trouble, and the Lord will answer them.” . . . .
Menahem b. Ammiel will come suddenly in the first month, the month of Nisan, on the fourteenth day of the month, and he will stand in the valley of Arbel, which belongs to Joshua b. Jehozadak the priest. . . . Menahem b. Ammiel will say to the elders and sages, I am the Lord’s anointed. The Lord sent me to bring you good tidings and to save you from the hand of these enemies.’ But the elders will look upon him and despise him, for all they will see is a man despised, in worn-out clothes, and they will despise him as you despised him. Then his anger will burn within him and he will put on clothes of vengeance as a garment and wrap himself in a mantle of zeal (see Isa 59:17). Rather than seeing Christianity as a new invention, seeing it as one of the paths that Judaism took — a path as ancient in its sources as the one that rabbinic Jews trod — has a majesty of its own. Many Jews were expecting the divine- human Messiah, the Son of Man. Many accepted Jesus as that figure, while others did not. Although there is precious little pre-Christian evidence among Jews for the suffering of the Messiah, there are good reasons to consider this too no stumbling block for the “Jewishness” of the ideas about the Messiah, Jesus as well. Let me make clear I am not claiming that Jesus and his followers contributed nothing new to the story of a suffering and dying Messiah; I am not, of course, denying them their own religious creativity. I am claiming that even this innovation, if indeed they innovated, was entirely within the spirit and hermeneutical method of ancient Judaism, and not a scandalous departure from it. second, by demonstrating how common the idea of a suffering and dying Messiah was among perfectly “orthodox” rabbinic Jews from the time of the Talmud and onward. I’ll leave the remainder of Boyarin’s discussion for another day. Here I want to look further at the suffering messianic idea within Judaic religious ideas. Some people insist that the idea of a conquering Davidic messiah to come to deliver the Jews is found “all through the Bible” but that is not true. It has become increasingly clear that Jewish expectations did not always concentrate on the Davidic Messiah but left room for a plurality of persons who would play a role at the time of salvation or shortly before. In all cases some biblical passage provided the basis or could be used as a warrant for these expectations. The idea of one such figure, that of an eschatological high priest, “the Anointed of Aaron,” also called “the anointed priest” (? ), was based upon the blessing of Levi in Deut 33:8-11 and the promise to Phinehas in Num 25:10-13 (see also ISam 2:35; Mal 2:4-7; Sir 45:23-24). In Qumran texts, “the Anointed of Aaron” ranks higher than “the Anointed of Israel,” but neither of them is a Savior figure, as they were possibly in the Testaments of the Twelve Patriarchs prior to their Christian adaptation. In rabbinic writings the future high priest (or kohen sedek) is simply mentioned. The expectation of another such person, that of a prophet like Moses, was based upon Deut 18:15-19 and/or upon the expanded text of Ex 20:19-22 in the Samaritan Pentateuch and 4QBibParaph (= 4Q158). In 11QMelch 18-20 the messenger of peace in Isa 52:7 is called “the Anointed of the Spirit” and is probably associated with the prophet like Moses (cf. IQS 9.11 and 4QTestim). Elijah was still another figure whose coming was expected. The hope for his return was based upon Mal 4:5-6 (cf. 3:1-4; Sir 48:10 and later texts). One could also mention the expectation of “the Anointed One, the son of Ephraim” or “of Joseph.” However there is no certain evidence before C.E. 135 for such an expectation. Here Deut 33:13 was the main warrant, but other passages, including Zech 12:10, were also applied to him. In this case the translation “Messiah” may be appropriate. The designation “Messiah of War” suggests some—but which?—relation to the priest in Deut 20:2. The number and functions of “eschatological persons” were open to considerable variation, as were the passages adduced. For example, the expectation of two leaders, a (Davidic) ruler and a Levitical (Aaronitic) priest must be considered normal (see e.g., Jer 23:5-6; Zech 3:6-8; 4:13-14; 6:9-13). This dual pattern reappears in Qumran writings and the Testaments of the Twelve Patriarchs, and also at the beginning of the insurrections in C.E. 66 and 132. Other pairs occur in later, mostly rabbinic texts: the Davidic Messiah and Moses or Elijah, Moses and Elijah, or Elijah and Enoch. The triad consisting of (the) prophet and the Anointed Ones of Aaron and Israel is attested by 4QTestim as well as by IQS 9.11. John 1:20-21 has the Christ, Elijah, and the prophet. TargYer I Ex 40:9-11 relates the royal Messiah, the high priest Elijah and the Messiah from Ephraim to the triad “the kingdom of the house of Judah,” Aaron, and Joshua. In interpretations of Zech 2:3 (ET 1:20) the number was extended to four, who in b.BBat. are identified as the two Messiahs (the Son of David and the Son of Joseph), Elijah, and the high priest, kohen sedek. In most cases, though not all, the warrior Messiah is supposed to fight and to die before the coming of the Davidic Messiah, but there is little evidence that Elijah was considered the precursor of the Messiah, as presupposed in Mk 9.11. The number of eschatological persons could be diminished as well as increased. In the textual transmission of Zech 6:11-13 the name of Zerubbabel may have been eliminated, but there are traces of the notion of the Davidic “Branch” at his side. The Damascus Document does not mention the eschatological prophet, and the Anointed Ones of Aaron and Israel may have merged and become one person (CD 12.23, etc.). In rabbinic texts, the prophet like Moses plays no independent role; the Messiah was rather considered to be the second redeemer and to be like the first redeemer, Moses. The eschatological high priest could be identified with the returning Elijah, whom some rabbis assumed to be the same person as Phinehas. The same texts and the same functions may be applied to more than one of the persons to come. For example, the identity of the mebasser of Isa 52:7 was left anonymous by some rabbis while others supposed him to be Elijah or the Messiah. Yet the Melchizedek fragment from Qumran may imply that he is to be identified with the prophet like Moses. In another text, the Balaam oracle (Num 24:17), the “star from Jacob” and the “scepter” (LXX: “man”) might refer to one or two persons. The expectations were normally derived from scriptural promises and predictions, or supported by passages which were assumed to refer to some person whose coming they announced. Selection, combination, and interpretation of the texts were contingent upon social setting, cultural environment, political structures, historical circumstances, etc. To some degree it is possible to trace the various forms of expectations to specific areas or groups. The expectation of a Davidic Messiah was contingent upon the recognition of the former and later prophets and the Psalms as sacred Scriptures. Thus Samaritan eschatology included several figures, but no Davidic prince. Even in parts of the Greek diaspora the promises to David and his offspring were of little, if any, importance (see, e.g., Philo). What is more remarkable is that this also seems to be the case in the Jewish-Christian traditions preserved in the Pseudo-Clementine Homilies and Recognitions. This may indicate that there also existed some other Jewish circles whose “messianic ideas” were almost exclusively warranted by the Pentateuch. Further evidence that the idea of multiple messiahs was far from alien to pre-Christian Judaic systems will be given in the next post. 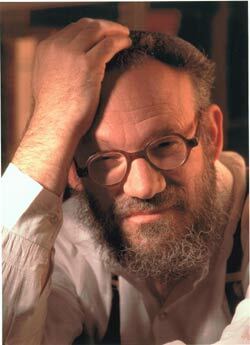 Boyarin, D. 2012. The Jewish Gospels: The Story of the Jewish Christ. The New Press, NY. Dahl, N.A. 1992. “Messianic Ideas and the Crucifixion of Jesus” in J.H. Charlesworth (ed. 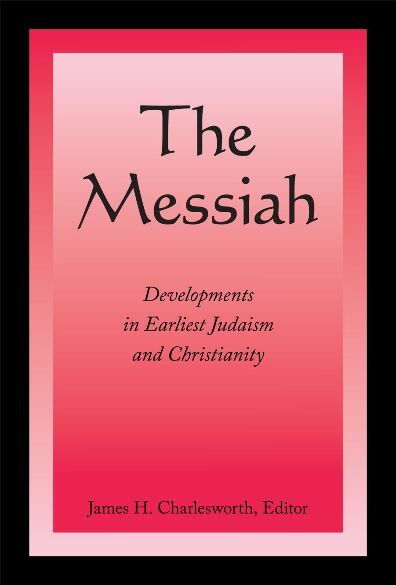 ), The Messiah: Developments in Earliest Judaism and Christianity. Fortress Press, Minneapolis. Himmelfarb, M. 2017. 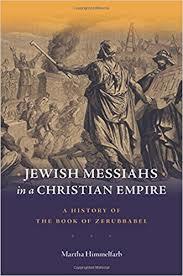 Jewish Messiahs in a Christian Empire: A History of the Book of Zerubbabel. Harvard University Press, Cambridge Mass. Neusner, J. 1984. 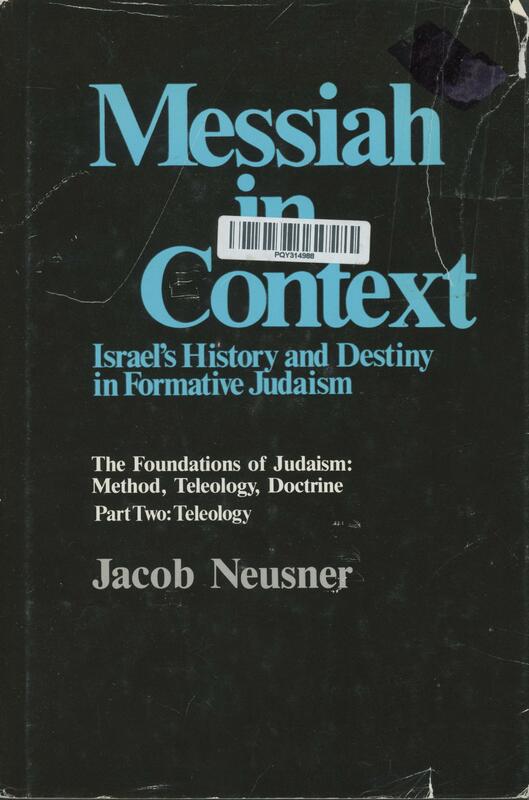 Messiah in Context: Israel’s History and Destiny in Formative Judaism. Fortress Press, Philadelphia. Posted on 2017-04-16 04:43:24 GMT+0000 by Neil Godfrey. This entry was posted in Messianism and tagged Dying messiah, Messiahs, Second Temple messianism, Suffering Servant. Bookmark the permalink. There is nothing unique about the concept of Messiah per se in Judaism, there were good smelling Messiahs in the scriptures. Novenson shows (persuasively to my mind) that in Paul’s usage: χριστός‚ should be seen as an example of a particular onomastic category, the “honorific.” Novenson defines an honorific as “a word that can function as a stand-in for a personal name but part of whose function is to retain its supernominal associations” That is, Paul reflects second-temple Jewish usage of χριστός‚ (and equivalents in other ancient languages) as an appellative for a figure (typically a human) who will act as God’s agent of eschatological redemption; but in Paul’s usage the term is applied exclusively and restrictively to Jesus. Indeed, in Paul’s usage the term is tied to Jesus so tightly that it can serve on its own to designate him (about 150 times in the uncontested letters, e.g., 1 Cor 15:3, 12-28). So would a Jew of Paul’s time even connect the dots that Messiahs are not supposed to hung up like a piece of meat. Alternatively, exegetical methods applied to the the scriptures may of made this an expectation. Later, I tried to find the original post to look up the details and couldn’t find it. However, I did find a passing reference to the general idea of the “Accursed Branch of Jesse”. Further search showed that members of this “accursed branch” had occasionally redeemed themselves and taken the throne. I wonder if this idea of the redemptive ability of the accursed branch may have contributed to the idea of the redemptive nature of the ignominous end attributed to Jesus? Would you be able to look into this? I haven’t come across anything about an “accursed branch of Jessie” but I will be covering the reason for Jesus’ crucifixion in a future post — and it does relate directly to the sort of messiah he was in the context of the various messianic ideas of that era. It’s in a Rick Springfield song. It is sometimes referred to as the “blood curse of Jeconiah”. Appreciate links if they are directly answering questions raised here but there is no need to post comments/links that do not directly address arguments in the posts or comments. I know of no evidence to support that idea. But we do have evidence to support other sources for the redemptive nature of Jesus’ death: see my posts on Levenson and his book, “Death and Resurrection of the Beloved Son”. Isaiah 53 is also a more likely source. It would be interesting to know when Himmelfarb puts the birth of the Jewish legend about a Messiah son of Joseph: around the same period of Marcion? If the answer is yes, then I would wonder: could Jesus become son of Joseph in the later Gospels only after that the Jews invented a Messiah ben Joseph, and this only after that the Jews listened the first time about marcionite Christians and were both ”repulsed and attracted” (per Himmelfarb) by the marcionite idea of a suffering Christ ? Another scholar, Joseph Heinemann, back in 1975 made a case for an Ephraimite or Josephite messiah figure well prior to the Bar Kochba revolt, but that the role associated with this figure was changed after the failure of that revolt so that from then on he was, like Bar Kochba, killed. Others have argued the Josephite messiah, dead or alive, did not emerge until some time after the Bar Kochba revolt. Himmelfarb is sceptical of Heinemann’s points and is prepared to question the assumption that Jews would not be influenced by Christianity. It appears that the most certain we can be (if “certain” is not too strong a word) is that a Messiah ben Joseph was known before around 200 CE (creation of the Mishnah). We are dealing with gossamer evidence, not rock solid evidence. The Jewish Dying Messiah has its roots in apocalyptic thinking in the Book of Daniel where the author tries to reinterpret the “70 Years of Captivity” as 70 weeks of years of captivity, or 490 years. Daniel 9:26 says that after 69 week-years, the Messiah would be removed and in the last week there would be a final battle before all the souls were taken up to heaven. This matches with the anointed High Priest Onias III being assassinated after being lured outside a garden sanctuary, marking the last “week” before Armageddon. As Randal McCraw Helms elaborates in “Who Wrote the Gospels”, this reinterpretation was then reinterpreted by 4 Ezra to be not about the Seleucids, but the Romans. The Gospel of Mark then reinterpreted the “Abomination of Desolation” about the Seleucid king Antiochus IV desecrating the Temple of Jerusalem as the destruction of the Jerusalem Temple by the Roman emperor Titus. Probably the most straightforward argument that the Jews of that time were accepting of dying/rising Messiahs is that Jesus’ followers had no problem with immediately interpreting Jesus in that way. That particular argument holds that those followers had to completely transform an unheard of, even unimaginable, interpretation of the scriptures that posited the messiah was to deliver Israel from the Romans. Those who did not follow the Christians even persecuted them because of their “blasphemous” notion of a failed or crucified messiah. So goes the argument. That is, the argument holds that only the most incomprehensible of experiences with a whole new reality caused the disciples to reinterpret scriptures and the messianic idea. That’s why Boyarin says the “commonplace view has to be rejected”. Far from being peculiar to Christianity, the general notion of a hero who dies to save his countrymen, is one of the most popular kind of story in the world. This genre refers often to military heroes, who die to save their fellow soldiers and their country. But there are more non-aggressive heroes too. Like Socrates, c. 360 Bc. Socrates, like Jesus, was condemned as an alleged heretic against the local God (s). But long before Jesus, he went obediently to his death, without any rebellion. In order to present us with the vision of a hero who is unjustly accused of treason or blasphemy. But who proves his essential loyalty, by obeying authority to the death. Demonstrating to everyone that his apparently heretical new innovations were new, but were not a fundamental threat to the old way of life. So tales of Christlike self sacrifice, were anything but unknown before Jesus. In point of fact, they were literally among the most popular kinds of stories in the world. And of course, such stories would have been known in Israel too, among many other countries. Long before Christianity. I heartily agree. Indeed, it is sometimes called “The Greatest Story Ever Told” and has been told and retold all throughout what we call “history”. I fail to see how this “Jewish suffering savior” is any different from the many pagan suffering saviors of the Mystery Religions. Pingback: Vridar » How Early Did Some Jews Believe in a Slain Messiah? Pingback: Vridar » Why did Luke trace Jesus’ genealogy through David’s son Nathan and not Solomon?